I added front disc brake kit, that part was smooth i would recommend Rusty Hope Kit.....However, after two days of fighting brake hose, lines, fittings, Auto Zone employees, cheap junk from >>>>>anyway i digress. I am done. I need help. 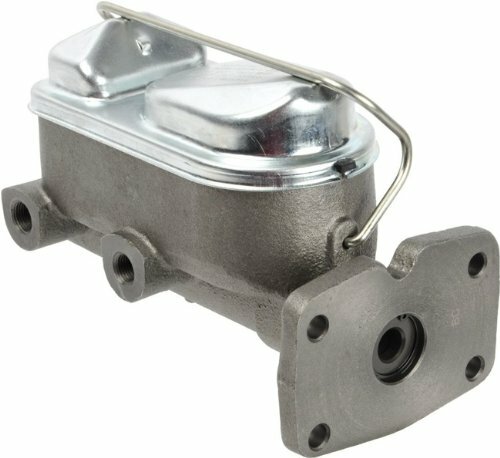 what master cylinder can i use for front disc and drum rear. I will put all new lines, and wheel cylinders are new. I just keep findng the pedal acts like it is either locked up or not hooked up at all. I installed a Cardone 1323M. Wondering what is going on. I am only doing this one more time. The MC seems to be fine bench bleeds great. put it on and i get fluid to the back passenger wheel, when bleeding there is no fluid, pedal doesnt drop when bleeder cracks???? is my pedal and rod setup not correct, seems to be? I am at a loss. Can i get a power booster and MC that will bolt right on? aftermarket with an adapter? what do i need to do? Location: Lower Mainland BC For starters, the Cardone 13-1323M (manual, drum/drum) isn't the master you need. You need one designed for disc fronts/drum rears. I think that you need to look for a Master Cylinder from an early Mopar disc/drum car, e.g. from the early 1970s. Perhaps like this RAYBESTOS MC36412 or a Cardone 12-1627.
ok. then do I need a proportioning valve or a residual valve? Location: N.W. Fla. drum/disc requires a proportioning valve. Ok. Is there a BOLT ON style mc with PV setup that people have used. Or do I get an adapter to a two hole mc or any suggestions would be helpful.